The history of Sunday Island is written in the many attempts of settling on its fertile slopes, all in vain. Now the New Zealand Government maintains presence with a small crew of devoted officers of the Department of Conservation. Because of its remoteness, and many failed attempts of taming her, Raoul or Sunday Island as it was known, still holds fascination for many. A volcanic island with fertile soils, located in a mild climate with regular and abundant rainfall, is just too much of a dream for those who fancy the adventures of the fictitious Swiss settler Robinson Crusoe. Centuries ago, these islands were already known to Polynesian seafarers and by the first Maori visiting New Zealand in canoes. The story goes that the Maori canoe Kura-haupo wrecked there, and that its survivors were picked up later by the Aotea canoe. Raoul and the Kermadecs have been a mixed blessing for seafarers, on the one hand to be avoided as navigation hazards, on the other hand to be sought for fresh water, meat, vegetables and fruits. The closest truly tropical islands lie further north: Samoa, Niue (Savage Island), Fiji and Tonga. Their traders also occasionally visited Raoul. The waters in this area were once frequented by sperm whales, in their hundreds or thousands, reason for American whalers, schooners and wind-jammers to visit the island. At one time it was noted that several dozen ships lay at anchor in Denham Bay, where most activity occurred. Invariably, many waves of Polynesians, including Maori must have settled on the islands. But Raoul was much more active in those days, and its earth quakes and rumblings easily drove off the superstitious natives. The best recorded and most successful attempt at cultivating the island, was made by the Bell family, who kept diaries of their adventures. In the mid 1950s, the information as recounted by their children, and as recorded in their diaries, was put together in a novel by Elsie K Morton (Crusoes of Sunday Island). But even they had to concede to the difficulties caused by remoteness and natural disasters. The wars also played their role. In the course of the settlers' attempts, many foreign species were introduced, both plant and animal. Of the animals, the goats, cats and rats had a most destructive influence on the islands. On Macauley the goats eradicated the native forest permanently, now a grassed turf. On Raoul the cats and rats extirpated three endemic (unique) bird species while driving very large numbers of seabirds off the islands. Some plants became invasive, and are now being eradicated by teams of volunteers. In June/July 2002 a major effort was undertaken to eradicate all mammals from the islands by carefully planned poison drops. It is hoped to make Raoul once again a safe haven for sea birds and song birds. Now the islands are administered by the Department of Conservation, who maintains a permanent staff of four and some volunteers to assist in the work. They maintain radio communication over the area, and man a permanent weather station. In 1990 the seas around the islands, to the maximum extent afforded by NZ law (12 nautical miles), were declared a marine reserve, without much opposition at all. This act secured an enormous area of 7840 square kilometre for future generations. DoC has two conflicting goals in preserving these islands: firstly to preserve the natural environment, and secondly also the historical heritage. Should the gigantic Norfolk pines, which are alien to these islands be torn down? The ancient but still fruiting orange trees? Recorded history starts with the visits of war ships of British and French nationality, for their ships' logs have been preserved. The chronological timeline below sketches Raoul's history from the late 1800s. 2100BC-1800AD: Raoul caldera erupts at least 9 times. 300-100BC: A violent explosion, comparable to that of Krakatoa, forms Denham Bay caldera. ~300 AD: Raoul erupts with exclusively basaltic magma (Judith tephra). 1788, 30 Jun: First British visit by Lieutenant Watts & Capt Sever in "Lady Penrhyn". They visit the islands but do not claim or name it. 1793, 17 Mar: French Admiral d'Entrecasteaux, searching for the ill-fated "La Perouse", discovered Sunday Island, naming it after his quartermaster Raoul. The frenchman also named the group "Kermadec" after Captain Huon Kermadec, of his consort ship Espérance (Hope). 1796: rediscovered by the British ship Britannia, a hired transport returning to England from Australia. The master, Captain Raven named Sunday Island in commemoration of the day of sighting, being unaware of it having been named already. Thirty years disappeared off the records. 1810-1860 During the period of the sailing whale ships, Sunday Island was the centre of one of the best sperm whaling grounds of the Pacific. Many boats visited Denham Bay. A niche in Denham Bay served as the local post office. 1814, 9 March: volcanic eruption of Raoul, accompanied by emission of much tephra from the Raoul caldera. 1827: Captain d'Urville visits the islands and reports them uninhabited. 1837-1854: several parties of settlers in Denham Bay built comfortable huts and traded food with the whalers. First Mr Baker (married to a Samoan woman) and Captain James Reed (married to a Maori woman, Kahumahinga of the Ngati Toa tribe at Te Awaiti), settled in Denham Bay. They cultivated the soil and grew bananas, garden produce, preserved mutton bird (a fat-rich petrel chick) and fish, and provided fresh water to the whalers. 1842: Baker visited Samoa and brought goats back. 1845: Reed returns to NZ. A heavy series of earthquakes alarmed Mr Baker and he also moved to NZ, leaving the island deserted. The eruption was early 1845 (possibly February). The Reed family were evacuated during the eruption by the American whaling ship - Montezuma. They arrived in the Bay of Islands in March 1845 following the eruption. 1853: violent earthquakes made the settlers flee the island. 1854 July 2: Capt M H Denham in HMS Herald came to complete a (chart) survey of the island. His son Fleetwood James Denham (16yrs) died from a tropical fever, and was buried near the beach at the head of Denham Bay, where a number of the grass-grown graves of former settlers were. The brass plaque heading this grave has been preserved (see plaque inscription below). 1860: a party of plague stricken (other accounts mention typhoid fever) Tokelau Islanders (kanaks), slaves for Peruvian Callao silver mines, were dumped on the island by a slave trader. They were denied landing in the Tongan Group. All died and also many (all) settlers with them. 1870: Chris Johnston and family and a companion with family arrived, built new huts and established gardens. But the whaling days were nearing to an end. They too were chased out by violent crater eruptions. Another American sailor, Mr Ledger, married to a Tongan native woman, came and reared a small family, but left in 1872. Feral cats may have dated back to this landing. 1872 (1870? ): A violent eruption occurred with hot lava flowing from the crater, followed by heavy flows of ashes and mud, and huge escapements of steam. The Green Lake was formed. Wolverine rock (named after the warship Wolverine) heaved up from the ocean during a violent eruption. First large enough to shelter a ship, it later sank back to become a submerged pinnacle, in 1878. 1872-1878: the island deserted. Chris Johnston meets Thomas Bell in his Apia (W-Samoa) seaside hotel, and tells of the deserted island full of bounties, of which Tom Bell could become King. Thomas Bell from Yorkshire, previously had a drapery business in Samoa. 1878, 9 Dec: Thomas Bell, wife Frederica and his family of 6 children settled on Sunday Island. Hettie Bell, the eldest, was 11 years old, and Bessie was nine. From her memoirs the book 'Crusoes of Sunday Island' was written. They were dropped off by Capt McKenzie on schooner Norval. All supplies purchased from the Norval, turned out rotten and useless. They first settled in Denham Bay, but later moved to the more hospitable northern side (Bell's Beach), first on the low flats and later moved to the high flats where they planted twelve Norfolk pines, which still stand today. Yankee whalers like the Canton (Capt Sherman), California (George Brightman), visited and traded supplies for food. Parkins Christian, descendant from Fletcher Christian the mutineer of the Bounty, was a famous visiting whaler. 1883: Thomas Bell brought from Auckland several hundred sheep, and some cattle. In 1885 700 more. The sheep were of the long-woolled variety and not very successful in the warmth of the subtropics while feeding on the rough grass which was planted here to survive salt spray. 1885 Aug, 18: The German flag hoisted at Apia, Western Samoa. It urged the British to become more active in the area. 1886: The Australian warship Diamond under orders of Great Britain, hoists the British flag and proclaims the island the Queen's Sovereignty as the first step towards annexation to the Colony of New Zealand. 1887 Aug 16: The NZ Government steamer Stella (after which the Stella Passage was named) with Captain Fairchild landed a party of Government officials, officers and crew on North Beach with the purpose of annexing the island to NZ. A flagpole was erected on Fleetwood Bluff and the British flag hoisted, and the Proclamation of Annexation read to all present. They also landed at Denham Bay, Curtis Island and Macauley. The scientist T F Cheeseman (after whom Cheeseman Island was named) of the Auckland Museum accompanied the expedition. 1889: the NZ Government threw Sunday Island open for settlement and divided it into three blocks of about 1000 acres (250Ha) each. Bell gets freehold of lot 9, the one facing north and 275 acres of land that is of no use to him. The other lots were leased by new settlers, but none of the lease holders made use of them. 1889 Oct: The settlers arrived: 20 men, women and children, but one year later, left the island in the Government steamer Hinemoa by Capt Fairchild. They tore down Bell's woolshed and wool bales to make huts, and were not good at cultivating the land. By this time, the Bell family had cows, pigs, sheep, poultry and turkeys; oranges, lemons, cooking bananas, taro root, yams, kumera, tea, coffee, tobacco, pawpaw, custard apples, figs, grapes, passion fruit, guavas, candle nuts, peaches and more. They had the benefit of education from an old schoolmaster, John Avent, since 1885. But one by one the grown-up children drifted back to civilisation, some emigrating to Canada. 1907-1908: a scientific expedition of 5 young scientists under leadership of Dr R B Oliver and Mr W L Wallace (the others were T Iredale, C E Warden and S R Oliver), stayed a year on Sunday Island, to investigate fauna, flora and geology. They arrived and left with the steamer Hinemoa. 1910 March 30: a violent tropical cyclone with heavy rains destroys much of Bell's property and produce. 1911 April 6: the Government steamer Tutanekai takes the Bell family off the island. The reduced family returns, but finally left for good in the beginning of 1914. 1914-1916: First World War. The german raider Wolfe (and most probably other German ships as well) use Denham Bay as a base, sinking the steamer Wairuna (1917). During their stay, the Germans lived rich on the fruits and vegetables of Bell's labours and ate what remained of the pigs and sheep. 1917 (approximately): The sailing vessel Columbia River was wrecked on the south end of Sunday Island, liberating a number of Norwegian grey rats and some cats. Their numbers increased rapidly, extirpating sea bird life on the island and also the native Polynesian rat. They were a real nuisance to the settlers by eating young plants and causing damage to fruits. 1926: Alfred Bacon and 2 companions (C Parker, James Ashworth) come to settle, but leave the same year. The banana plantations had been eaten down by goats and only odd palm trees were bearing fruit. Charles Parker, in the course of clearing scrub, contracted blood poisoning and died of tetanus. The others lost heart and returned to NZ with the Hinemoa. The photograph shows the grave of Charles 'Chas' Parker, underneath the Norfolk pines planted by the Bell family. 1929: The Sunday Island Settlement Association was formed. Headed by A Bacon, two families settled there, and were still present in 1937. Various trips were made by private enterprise to investigate commercial possibilities and further settlement. 1938: The NZ Government established a permanent radio and meteorological station. 1939: The Kermadecs came under control of the NZ Government Civil Aviation Administration, who renamed Sunday Island to Raoul Island. Permanent settlement is now discouraged because of the island's extreme isolation and risk of volcanism. 1964, 21 Nov: a short but dramatic sequence of explosions in the crater leads to an ash column 1.2km high. The island is evacuated out of precaution. A large crater measuring 100m diameter and 80m deep, was blasted out, 250m NW of green lake. 1990: a large no-take marine reserve was established around all islands and outcrops. 2002: a major effort to poison all rats and cats was undertaken. He died aboard the Herald at this Island on the 8th day of July, 1854, aged 16 years, leaving an afflicted parent to mourn his loss here, and many at home who dearly loved him. This tablet is erected by his bereaved father and shipmates, as a last testimony of their esteem. Here are some hand-drawn maps as they appeared in Elsie K Morton's book Crusoes of Sunday Island. Their various features have been annotated below. Note that a modern topographic map and a detailed marine chart are now available. Denham Bay: One needs to get through usually heavy surf to make the landing, which is a problem for supplies. In either the northern or the southern end of the beach, waves can be much smaller than in the middle, but the slope of the beach can be steep. Somewhere in the centre of the beach, usually a strong outward going rip is formed, running against the sea and flattening it, which may allow for landing. The flats behind the beach have been farmed, and there is a fresh water lagoon. The flats are surrounded by almost insurmountably steep cliffs, but there is now a well maintained track leading to the main centre on Fleetwood Bluff. North Beach and Bell's Beach: These provide access to the northern flats, but do not have sheltered corners. Supplies can relatively easily be carried up the low flats and from there to Fleetwood Bluff. Fishing Rock: This is a hard lava flow, jutting out from the soft cliffs. With care, boats can get close to a derrick, and supplies hoisted on shore. A flying fox runs from there to the upper landing, where a good track leads over the crater rim to Fleetwood Bluff. This is now the main landing site. Boat Cove: Sheltered from northerly weather, Boat Cove has a landing at the bottom of steep cliffs. From here a flying fox runs to a top landing, accessed by a long and poor track to the living compound at Fleetwood Bluff. The map above shows more detail of the most important areas of the island. Unfortunately, Fishing Rock (top right) has just been cut off. The island has a crater, which scientists call a caldera on account of its many miniature craters. The Blue Lake is its main feature, and the green lake second. Tui lake is a hard-to-find little lake, which is no longer what it once was. The crater area is the main centre of volcanic activity, but Raoul's most explosive crater lies under Denham Bay, which was created by one of its earlier explosions. 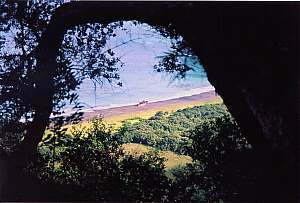 In its early days, Denham Bay was the centre of all activities. The map shows Bell's first hut, the historical flagstaff, the lagoon, steaming cliffs and the location of Denham's grave. The Bell family left this area, after expending considerable effort on it, and moved to the northern flats. The map shows where Bell began his cultivation (Bell's hut) and where they ended up living (Bell's house). Bell's Ravine is a very narrow canyon, almost invisible from the sea, cutting through the western side of Fleetwood Bluff. On the Terraces, a primitive landing strip is maintained and mowed but very few air planes are equipped to land here.